So, you’ve bagged yourself a job in the Alps and are headed off for the winter of your life. Brilliant! Yet as time draws near to setting off and the excitement sets in, your thoughts might turn to the slightly mundane thought of packing. Maybe you’ve been on a few ski holidays before and know that packing lightly for the snow isn’t the easiest of tasks; helmets, boots, jackets, thermals .. and that’s just for a week! How on earth are you going to cram your whole life in to a bag for 6 months? Worry not; we’ve got this down to a fine art and are happy to share our wisdom on the subject. First things first; obviously, you will be skiing. This means ski clothes are pretty important. A helmet is of course a must. And a good pair of goggles (skiing blind in a white-out is no fun). 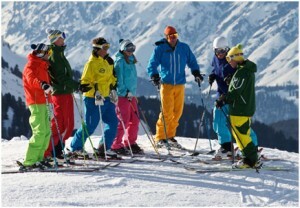 Fashions come and go but we recommend the brighter end of the spectrum when choosing your skiing garments. The brighter the better! A couple of funky beanies and hoodies will come in useful (you will probably live in them for most of the season). We would probably also advise packing a couple of pairs of salopettes (incase of the inevitable beer/jaeger spillages in après-ski). In need of some inspiration? Check out our friends at The Winter Children www.thewinterchildren.co.uk. It really isn’t necessary to stock up on expensive ski gear before you go. If you have your own skis/boots – great. 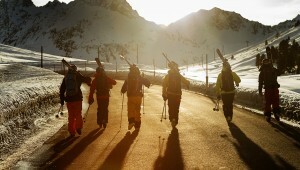 If not, most employers provide ski and equipment rental as part of your package, which is one of the perks of the job. Your season is great time to try out different skis/boards/boots while you have the time. You could even treat yourself with the money you’ve saved in the end of season sales, where you can get your hands on some fantastic deals. Now the fun stuff’s dealt with, on to the subject of work. As well as shredding those pistes and generally having the time of your life, a great deal of your time will of course be spent at work. Whether you work in a chalet or a bar, repping or cheffing; comfortable shoes for work are a must. You will be on your feet a lot and they will hurt. So invest in good pair of shoes. Also note that socks become almost sacred when doing a season; they have a way of disappearing. Pack plenty! Girls: We recommend stocking up on as much shampoo, conditioner, and make-up as you can before you go. You can of course get hold of it in resort, but it tends to cost a fortune. Dry shampoo can also be a life saver when you are dashing about and don’t have time for hair washing! You will also be thankful for a few nice evening/’going out’ tops, as it is nice to dress up from time to time! Health: One thing that most seasonaires forget about is to look after themselves. You are too busy looking after guests/customers and enjoying yourself. But trust us, you will inevitably get ill at some point. Try and avoid the inevitable by taking a good stash of vitamins with you (Berocca etc). (While we are at it – remember to eat properly and drink plenty of water! – the dry air in the mountains means you should drink double the amount of water than you would normally). Pack a good stash of Nurofen/paracetomol, plasters and other first-aid necessities! (These are also expensive in resort). 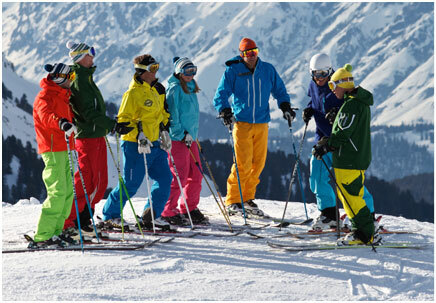 Finally – not a week goes by in a ski resort without some sort of fancy-dress occasion; and you will kick yourself that you left that TOWIE outfit at home when there is a TOWIE themed opening party for a bar on your second day in resort. Make sure you pack at least a couple of fancy-dress outfits for such occasions.